Thank you to Booktrope for sending me this book via Netgalley in exchange for an honest review. Magic is a tricky thing. Especially when it comes from an ancient book of spells that jumps off a shelf into Olivia’s hands. Bad news for the popular girls in her new school who don’t like Olivia. But hey–now she can get the attention of her crush who’s more interested in comic book superheroes. And when she finds out her aunt is a witch, she imagines all her problems are solved. Unfortunately, not quite–what she conjures up is trouble. And the only one who can help her is an 800-year-old woman. I love the YA Paranormal genre, but hadn't read much of it recently. So when I got the opportunity to read Be Careful What You Witch For I jumped at the chance. I'd never got the chance to read a book in this genre featuring Witchcraft/Wicca before, so I was rather interested to see what it was going to bring. Be Careful What You Witch For takes us on a journey with teenager Olivia, who's parents are famous actors. When they get scheduled for a movie shoot in Egypt, Olivia, wanting to just be out of the spotlight and live a normal teenage life for a while plans to live with her Aunt Tilda in New York for the year. However, as soon as she arrives she notices something is strange about her aunt. For one thing she can read her mind and secondly she seems to think her cat is a ten year old boy! School is another thing, from her first day Olivia becomes a 'misfit', causing the popular kids to automatically dislike her, especially Queen Bee Madison. She does however develop a crush on Alex, the x-men loving, slightly dippy hunk of the school. When she visits her aunt's friend, Eva, she accidentally casts a spell, causing Alex to start an infatuation with her. As she discovers more about the magic happening around her, trouble begins to brew. I found this book to have a rather interesting concept. I loved finding out all about witchcraft and discovering all the different kinds of spells that could be conjured. However, I also felt like the plot was somehow rushed. I felt like some things were explained entirely and I feel like that somehow ruined it for me. I would've loved to have known more about Eva's life and her curse and also how Aunt Tilda discovered the art of Wicca. It would've also been great to maybe meet Olivia's parents and see how they differed. Despite being that protagonist I found Olivia rather hard to warm up too. At the start I thought of her as a snobby girl who wanted her own way all of the time, which may have been how the author wanted her to come across at first. However, throughout reading I started to warm to her more and I did actually like her come the end. The stand out character of this book to me was Eva. I just adored the way her personality came out, and I was imagining all types of situations she could be put in. I would also love a cup of her famous tea please? 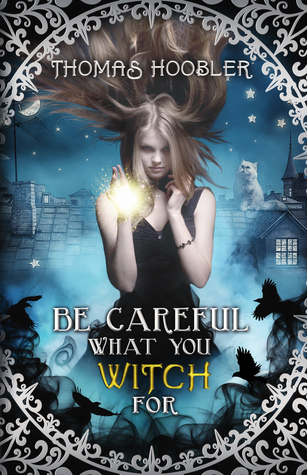 Be Careful What You Witch For, in my opinion, is a quick, easy read. The fast moving plot slightly ruined what could've been a good book, but it made up for that with a few great characters and it's explanation of a topic that not many people know about in great detail. It's made me want to research more into Wicca, that's a fact.